We have started reading and discussing picture books with a theme of kindness. 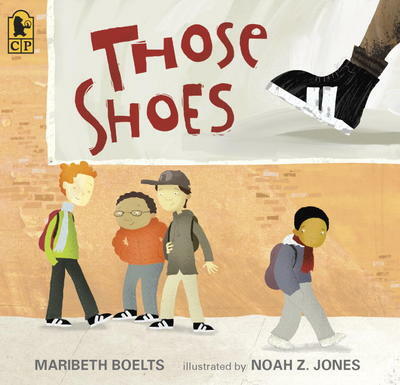 Those Shoes written by Maribeth Boelts and illustrated by Noah Z. Jones was an ideal book with which to start. This book helped us to explore the difference between our needs and our wants and how to come to terms with the understanding that sometimes we have to give up something we really want when it just doesn’t make sense despite our strong feelings. Jeremy wants those shoes –the shoes he sees advertised on a billboard and walking around him everywhere he looks. Black high tops with two white stripes. Perfection. He wants them especially a lot when his own shoes wear out and the guidance counsellor roots around in a box to find him shoes that fit. Blue velcro shoes with a cartoon animal on the side. Nothing like those shoes he dreams about. Shoes he needs but doesn’t want. Grandma invites Jeremy to go check out the shoes, those shoes, at the store. She has a little bit of money set aside. But at the store, she discovers the price. When she sees it, she sits down heavy. Silence in our class. Students had just commented how kind Grandma was being to take Jeremy shopping for the shoes he really wanted. Now what? I asked, “Can we only show kindness if we have money to buy something?” Well no, of course not but we all had to sit there and feel Jeremy’s disappointment for a while. What next? Jeremy suggests they go looking in the thrift stores for those shoes and in Lucky Store # 3, he finds them. However, squished toes and held breath tell us that these shoes are too small. Still Jeremy buys them because he wants them that much. Jeremy’s new shoes are unbearable and unwearable. One day he notices a classmate’s shoes are taped up – worn out. Antonio seems to have smaller feet than him. The thought that he might have in his possession shoes that could fit Antonio, those shoes, eats at Jeremy. He repeats this thought in his head and out loud. No way. No how. But after a sleepless night, Jeremy runs his shoes, those shoes over to Antonio’s door and leaves them there for him. Jeremy is not fully happy – when he looks down at his own blue shoes that aren’t those shoes he feels upset but Antonio’s face brings him joy. “He gave up those shoes from the kindness of his heart,” commented Shae-Lynn. “And he’ll get kindness back,” said Catriona. Jeremy learned a lot in this book. Sometimes kindness wins but it isn’t completely easy. Our emotions can be mixed. Sometimes we learn that when we have what we need (new snowboots thanks to Grandma) we can appreciate other things (a new snow day). Sometimes our wants bring us unhappiness and giving them up is where we grow. Sometimes kindness is simply giving other people what they need. So much to discuss in this gem of a picture book. Truman: Jeremy gave kindness to Antonio by giving his too small shoes to Antonio. Khai: Jeremy saw Antonio’s shoes and they were broken. Jeremy wondered and wondered and went to Antonio’s house and left the shoes on the porch. Jeremy did it even though he got nothing back. Markus: The Grandma was nice in the story. She tried to get shoes for her grandson. Purity: Jeremy gave the shoes to Antonio even though he really liked them. They didn’t fit Jeremy so he gave them to Antonio because Antonio needed them. This entry was posted in Uncategorized and tagged favourite illustrators, fiction, great read alouds, kindness, making connections, Maribeth Boelts, Noah Z. Jones, philosophical discussion, picture books by carriegelson. Bookmark the permalink. We also read “Those Shoes.” Today we read your comments and we think they are very thoughtful. We agree that this book is about kindness. In our class we like to give statements of appreciation to each other. This sounds like your ideas about gratitude. We enjoyed reading the comments you made about the book. We are thrilled that your class also read and spent time thinking about this book. We will check out your blog and look forward to any comments about Those Shoes!